Case studies of total system cost in pumps and process equipment. The drive to reduce costs and environmental concerns have caused many design and processing engineers to turn to perfluoroelastomer sealing parts as the most cost-effective sealing solution. The value-in-use of perfluoroelastomers can be proven in operating conditions where conventional elastomers fail. Even under less arduous conditions, DuPont™ Kalrez® perfluoroelastomer seals can be the best solution, as they can last significantly longer than conventional sealing solutions. 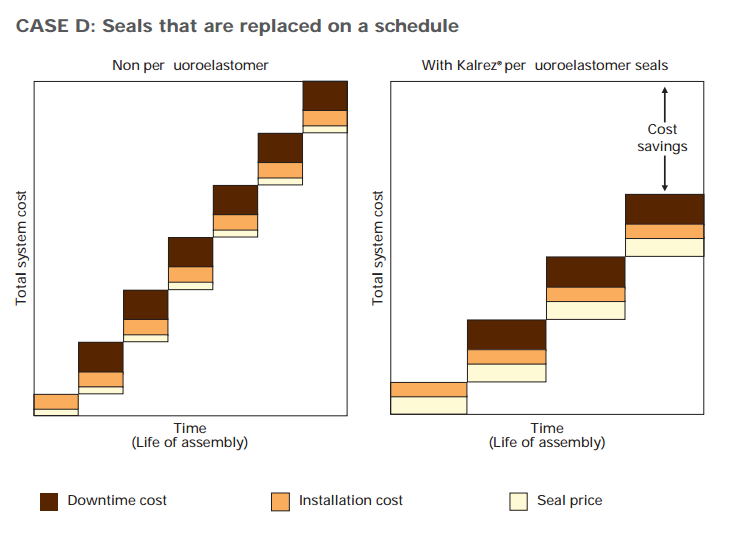 Economics depend on the total system cost When considering the economics of elastomeric seals, it is vital to look beyond the cost of the seal itself and compare the total cost related to the sealing solution. 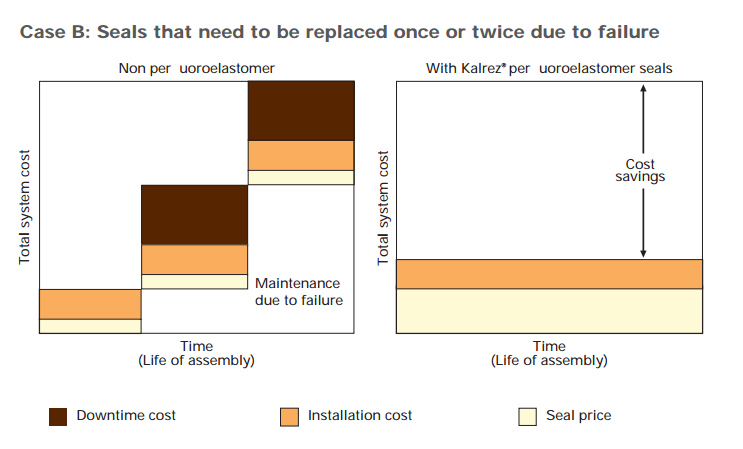 The total system cost in use is the sum of the cost of O-ring seal + installation cost + downtime cost (including loss of productivity through leakage + clean-up costs). Seals that last for the life of process equipment In this situation the seals are not being replaced, as they last for the life of the pump or of the equipment. Strictly on a cost basis, perfluoroelastomers cannot be justified. Seals that need to be replaced once or twice due to failure This is the situation in which seals need to be replaced for failure or maintenance reasons once or twice during the life of the equipment, introducing the added factor of downtime cost each time the seal is changed. Using DuPont™ Kalrez® perfluoroelastomer seals could be the most cost-efficient solution. Seals that need to be replaced repeatedly In this situation, seals need to be replaced several times. Using a conservative estimate of service life of perfluoroelastomer seals being four times that of conventional sealing material, the replacement and downtime costs associated with repeated, multiple replacements of existing seals far outweigh the initial higher costs of perfluoroelastomers. 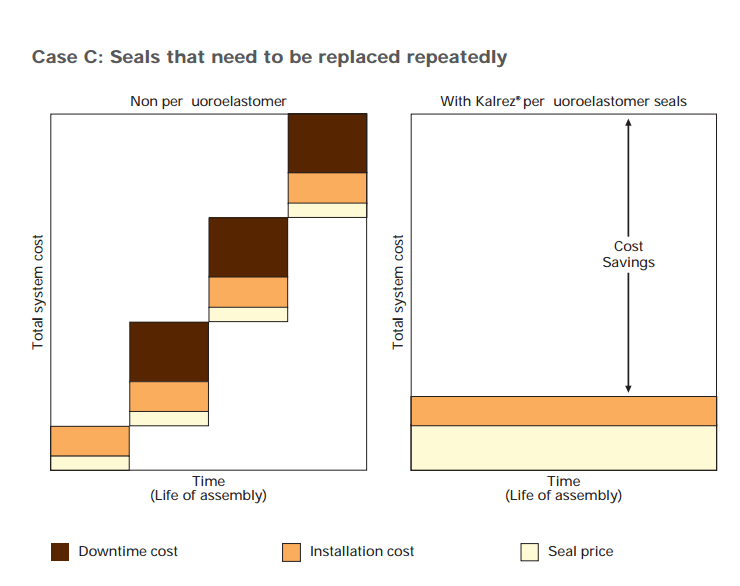 In addition, the unplanned replacement of existing seals would further increase downtime costs, as well as having other, possibly serious, effects. Seals that are replaced on a schedule When seal replacement is regularly scheduled instead of wait-to-fail, for reasons of safety, service, quality or economy, the downtime costs incurred in replacing existing seals is usually constant. The added expense of switching to DuPont™ Kalrez® perfluoroelastomer seals should be offset by doubling periods between overhauls. In certain cases, this period could typically be tripled or quadrupled.